Bermudian actor Earl Cameron will be the first inductee in the UK’s first black film and television Hall of Fame, according to a story in the Voice Online. Mr Cameron’s barrier-breaking career spans more than a half-century and includes dozens of stage, TV and film credits. Born in Bermuda in 1917, he moved to Britain prior to World War II and after a career on London’s West End stage made his film debut in 1950 — becoming one of the first black actors to star in a British movie. He co-starred with Sean Connery in the 007 blockbuster ”Thunderball” playing Pinder, head of the British Secret Service’s Bahamas outpost. He portrayed African dictator Edmond Zuwanie in the 2005 thriller “The Interpreter” alongside Nicole Kidman and Sean Penn, and had a featured role in the Leonardo DiCaprio science fiction epic “Inception” in 2010. The story said “The Screen Nation Foundation, the charitable arm of the Screen Nation Awards, has announced it will launch the UK’s first black film and television Hall of Fame, honouring individuals of African-Caribbean heritage who have made extraordinary contributions on screen. 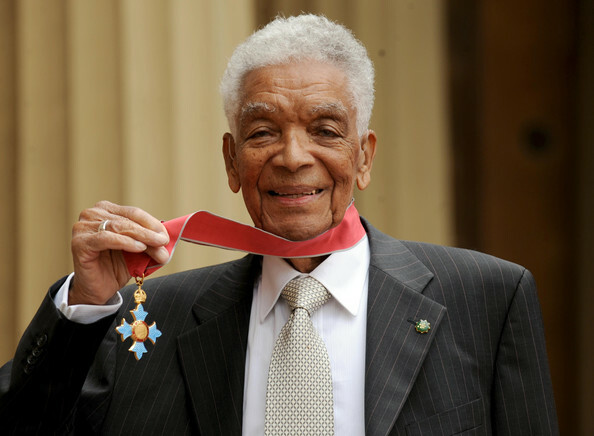 “Veteran performer Earl Cameron CBE will be the first inductee when it is formally unveiled on October 23. “The Screen Nation Hall of Fame launch will also coincide with Black History Month and BFI Black Star, the UK’s biggest ever celebration of black screen talent. “To mark the occasion, the legacy project will feature a masterclass style career talk with Cameron to discuss his inspiring 70-year career. “The 99-year-old, who has been acknowledged by many as one of the first African Caribbean screen actors to break the colour bar in the UK, has appeared in over 90 films and countless television productions. Well done well done well done. We are proud of you more than words can measure. EARL CAMERON is. God bless him. Thank you, Earl. Absolutely fantastic and very deserving. Well done Mr Cameron!.